Through a good friend, Shirrin and I got to see a press screening of Saawariya today afternoon. This was before the official premiere here in NYC. The press screening was at the lovely AMC 25 here in Times Square. The theater had just a handful of “scribes” and two tough looking guys walking the aisles, lest we sneak in a video camera and do a screenprint. The movie starts with Rani Mukherjee narrating about a dream. The location is a virtual city of dreams. The debutantes Ranbir Kapoor and Sonam Kapoor are systematically introduced into the movie. Sonam definitely has the looks and the makings of a good actress. Her character Sakina is an innocent young girl who falls in love and loses her heart to a paying guest Imaan. Salman Khan as Imaan is for once completely clothed in the movie. None of the pumped up muscles or torso. He has a short cameo in the film, more like a special appearance. Ranbir Kapoor I felt tried too hard to act. He was good in bits and parts but by the first half hour it was evident that he was trying too hard to make the acting cut. His wardrobe and mannerism had more than a striking similarity to his grandfather the late Raj Kapoor in Mera Naam Joker. Even the bar, where he sings in the movie is RK Bar. Blech !! Rani Mukherjee gives a polished performance, but I felt her role was more of an afterthought. She continuously flits in and out of the movie but has no real substance. The old Anglo-Indian landlady is nicely played by Zohra Sehgal who brings in some humor in the movie. However a lot of the scenes in the movie did not make sense. There is one where Ranbit Kapoor wraps a towel around his waist and then stands at the window and gives a free show to the outside world. He then dances around in the towel to a senseless song. Who ever thought of that crazy sequence. Except for the title song, none of the others are noteworthy. Cinematography is good in some instances but is average otherwise. I think that the location and lighting throughout the movie could have been reworked a bit. All in all an OK movie, and nothing you will regret if you don’t see it first day, first show. There. That’s it. My first hindi movie review on my blog. To read a more thorough and professional review hop on over to Filmiholic who was with us during the screening. World Dumping Dollars: China Ready to Exit the DollarIs Benazir Bhutto a Fake Too ? Arzan, thanks for the review of your very first Hindi movie. There is always the first isn’t it? 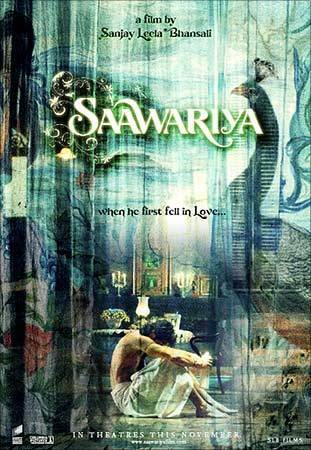 The word “Saawariya” sounds so good, will check out the film. Thanks for the Diwali wishes from Shirrin and your families. By the way, where am I on your blog roll? Hope to be in your desh next week.